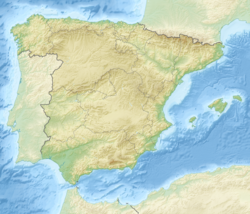 Aguaviva (Spanish: [ˈaɣwaˈβiβa]) or Aiguaiva de Bergantes (Catalan: [ˌajɣwəˈiβə ðə βəɾˈɣantəs]) is a municipality located in the province of Teruel, Aragon, Spain. According to the 2004 census (INE), the municipality had a population of 670 inhabitants. It is known as Aiguaiva de Bergantes in the local Catalan variety because river Bergantes flows by the eastern end of the town. This article about a location in Aragon, Spain, is a stub. You can help Wikipedia by expanding it.